Why is Mike and Ike Called Mike and Ike? One of the biggest mysteries in candy: who is Mike and Ike? Or more accurately, where did their names come from? Headquartered in Bethlehem, Pennsylvania, the Just Born company produces Mike and Ike candies as well as Hot Tamale’s, Peeps, and various other candies. Mike and Ike was created by Sam Born, a Russian immigrant and candy connoisseur who started with a small candy shop named Just Born in 1932. The Just Born company began to grow rapidly after its acquisition of the Maillard Corporation in 1935. This lead to the creation of its flagship brand, Mike and Ike. Not much is known about the actual development of the their name beyond a few rumors on how the name came to be. Why is it Called Mike and Ike? Although the exact origins of the Mike and Ike brand name may not be known, the manufacturer did give a strong nod to one of the major theories on the inspiration behind the name. In the early 1960’s, the Mike and Ike brand released packaging with characters taking a physical form for the first time as Mike and Ike. The interesting thing about the Characters is that they appeared in a very “vaudeville” manor in the way they dressed and the time period they appeared to come from. Again, there is no way to know for certain as the duo was never officially announced until after Sam Born passed away, but it is interesting that this image was selected as the first representation of Mike and Ike. Over the years, the Mike and Ike brand has created more than 40 flavors of candies, some of which have come to encompasses certain times of the year such as Root beer floats for the summer, and cotton candy for the fall. For the last 70+ years, Mike and Ike have maintained their status as one of the top candy companies in the world. Even with the name, the Just Born company, the Mike and Ike brand has always looked for ways to innovate and maintain its mindshare. This was most evident in 2012 when the Mike and Ike brand invested in a whopping 15 million dollar advertising campaign to reinvent Mike and Ike by showing them splitting up and going their separate ways. 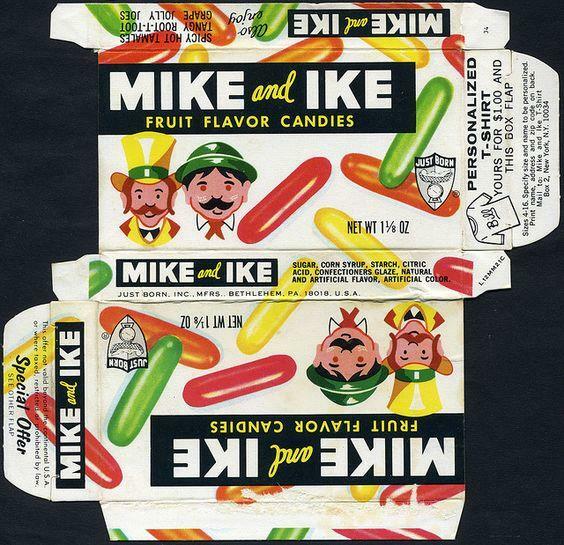 The advertising campaign started with the candy packages showing either Mike or Ike scribbled out with marker and on the back, a reason for why Mike or Ike decided to part ways. After a year-long campaign, the Mike and Ike reunion occurred with the release of a movie trailer and the roll out of a new flavor, “Strawberry Reunion”. The campaign worked wonders as the Mike and Ike brand reported their highest sales in 10 years and a rise in revenue of more than 9.3 percent in the following fiscal year. So I guess the age old adage is true, absence really does make the heart grow fonder.